Edit: The Bill had a second reading in the upper house, then disappeared into committee and was never heard from again. It lapsed at the end of the last parliamentary session, and would now need to be reintroduced to be considered by the new parliament. Victoria's Judicial Commission has arrived. The new legislation announced by the Attorney General in June has passed the Lower House. Once passed by the Council and given Royal Assent it will commence on the 1st January 2012, unless proclaimed earlier. A government press release came out on 1st September, the date of First Reading. From there the Second Reading was moved a day later and Third Reading in the lower house passed by special majority today. The Explanatory Memorandum is here. The Act itself here. The Statement of Compatibility is here and the Second Reading Speech is here. 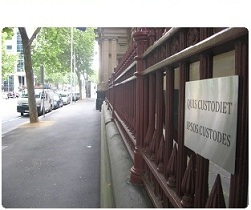 Presently in Victoria, there are two methods for dealing with complaints and concerns about judicial conduct. In cases where conduct may warrant removal from office, an investigating committee formed in accordance with the Constitution Act 1975 decides whether facts exist that could warrant removal. A judicial officer may be removed by the governor upon an address of both houses of Parliament by a special majority seeking removal due to proved misbehaviour by or incapacity of the judicial officer. In cases of less serious complaints that do not warrant removal from office, there is currently no formal complaints process. In practice, the head of jurisdiction deals with these matters. The bill combines processes for dealing with both serious and less serious complaints, and invests them in a single complaints body, thereby modernising the system and creating a more efficient and structured approach. The Commission will be a public statutory body that handles complaints against the judiciary, both in a professional and private capacity. It will also have the ability to require judicial officers to undergo medical reviews where unfitness to perform offical duties is suspected. The Commission's board will consist of ten members: six are the Chief Justice of the Supreme Court, the Chief Judge of the County Court, the Chief Magistrate, the President of the Children's Court, the State Coroner, and the President of VCAT. The remaining four board positions will be appointed by the Attorney-General. Parallels with the Judicial Commission of NSW are obvious. The education wing of the new Commission will take over the role currently played by the Judicial College, a move the College itself viewed cautiously. It has been funny to watch Marilyn Warren and friends resist the introduction of some sort of oversight, even if it is only more judges (and a few government appointments) who will be looking over thier shoulders. She argued that it would "erode public confidence" in the courts. when she's judging a person, a company or an institution does she worry about eroding public confidence in it? Should she? Or is it justice that comes before public perceptions? (Interesting to read the last two articles on this site in regards to that). I think your criticisms are a little extreme. The kind of "oversight" I think the judiciary are most concerned about are consultants coming in and "advising" judges how long the perfect judgment should be or how short the trial docket could become if leave to appeal was refused a bit more often. You may think that sort of think cannot happen but it is only a strong independent judiciary that ensures it does not. And I realise it is not greatly important but the quote about absolute power properly belongs to John Emerich Edward Dalberg-Acton and not Pitt the Elder. I stand corrected on the quote but not on what it stands for. Warren defends the court system like a company chairman defending a dodgy product. You label any recent noteworthy examples where things have gone wrong as media beat-ups and "isolated examples" which have been "taken out of context". You blame the media for being sensational and the public for being "ill-informed" (a polite way of saying ignorant and stupid) and tell both groups to spend more time staring at numbers that your bean-counters have massaged to make your performance look amazing. (I would say something about "lies, damn lies and statistics" now but I'm worried I'd quote the wrong person). I'll tell you why "minor crime" is dropping: people don't bother reporting it any more. When the police came out with telephone reporting it was the final proof that they don't have the slightest interest in catching whoever smashed your letterbox or broke into your car. It's just an insurance formality now and if you aren't going to lodge a claim why would you waste your time. If the cops do accidentally catch the kid who did it the court will give them a social worker to talk about their problems with and access to opportunities that decent kids don't get. This wouldn't bother me if the letterbox smashers and car thieves of today didn't turn out to be the major thugs of tomorrow. People who point to the fact that some murderers and drug dealers don't have convictions miss the important point that they ARE NOT BEING CAUGHT for the stuff they do anymore and they are get endless warnings and cautions and slaps on the wrist when they do.